Brickman, the New York-based real estate investor, is particularly adept at identifying older multi-tenant office buildings that yearn for tender loving care and giving them a fresh start. 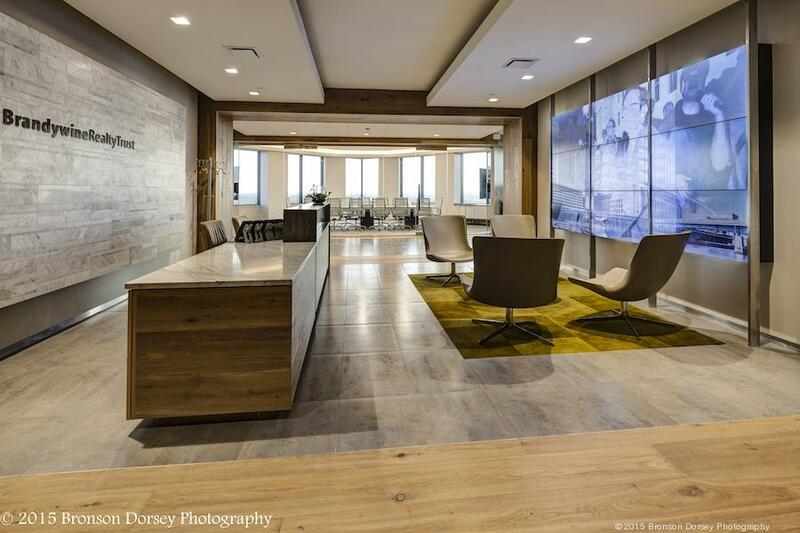 823 Congress, a 16-story, 1971 office building, is Brickman’s latest makeover in Austin. Previously, Brickman gave Lavaca Plaza, 504 Lavaca St., a radical facelift before selling to Seattle-based Unico in January 2015. After that sale I didn’t think Brickman would stay in the Austin market, as value-add opportunities had grown scarce. Brickman, however, discovered a diamond in the rough at 823 Congress. Since purchasing the property in October 2016, Brickman has updated all aspects of the property — from the barebones infrastructure to the vibe around the perimeter. Brickman also embraced an innovative strategy — finishing out spec office space with the hope of appealing to a company that doesn’t want the hassle of overseeing design and construction. 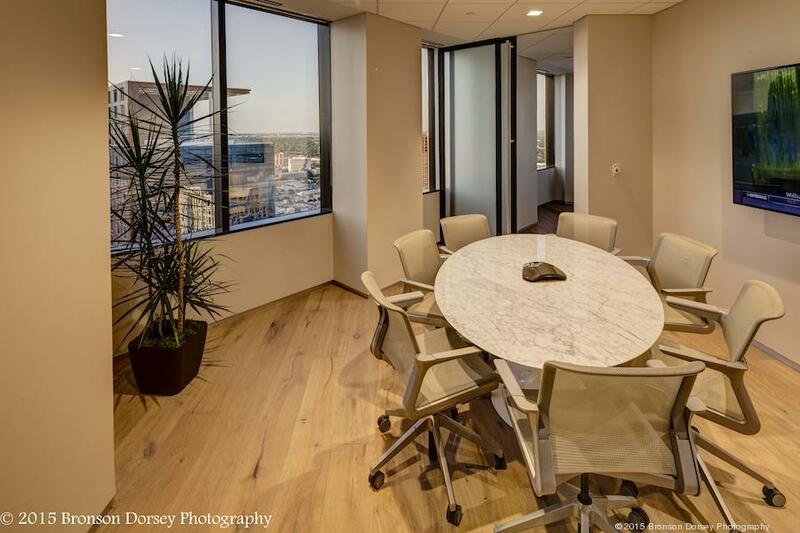 Very likely, there are other companies that simply require office space tout de suit — without delay. In the case of 823 Congress, Brickman has built out the entire 12th floor, and now a company — as yet unidentified — is under contract for that space. “What we’ve done on the 12th floor speaks volumes about our work,” Kotcher said. The Brickman team is adept at assessing variables, he added — knowing when to build out 1,600 square feet or when to finish out two full floors. Another Brickman strategy? Engaging tenants before they open the door to the lobby. Thus, two local food truck favorites — Chi’lantro and Garbo’s — were recruited to the pocket park outside. Other appeal has been achieved with new signage, a renovated lobby, new elevator cabs, a communal conference room, a new fitness facility with showers and lockers and a tenant lounge. The recent announcement that Industrious has leased 24,000 square feet also is working its magic on would-be tenants who want to be associated with the coworking powerhouse. Though Brickman and Industrious both are based in New York with operations in multiple U.S. cities, this is the first lease deal between the two. “The building’s redevelopment plans and proximity to downtown amenities, shopping, and dining options were extremely appealing. Our members will love it,” said Troy Volkel, Industrious’ real estate manager. Kotcher anticipates Industrious will draw its usual maverick clientele along with government lobbyists and public affairs personnel who must be near the State Capitol. He’s keen on what Industrious brings to the 823 Congress tenant mix. “Industrious is a good fit for us,” Kotcher said. Brickman’s listing company, ECR, believes the Industrious cachet provides an inducement for other tenants. Industrious expects to finish the 823 Congress location in the third quarter. Meanwhile, Brickman still has its sights across Austin. “We’re actively looking in Austin. There are good fundamentals here,” Kotcher said. 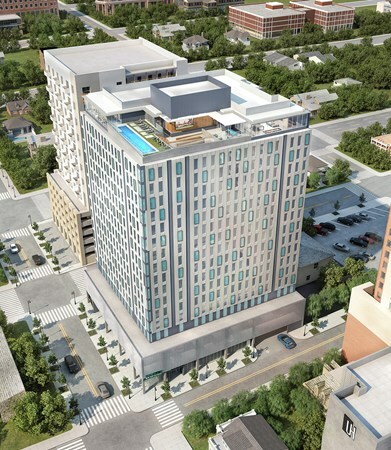 The 18-story student housing community The Muze, located at 2100 Nueces St., just three blocks from The University of Texas at Austin campus, has topped out. The development is pursuing certification from the National Green Building Standard and Austin Energy Green Building. Earlier this year, Asset Campus Housing assumed property management tasks at the 158-unit property. The Muze will consist of studio, one-, two-, three- and four-bedroom fully furnished apartments totaling 502 beds. Every bedroom will have its own bathroom and residents will also benefit from quartz countertops in kitchens, stainless steel appliances, in-unit washers and dryers, walk-in closets, SMART housing units, hardwood-style flooring and ceiling fans. Common-area amenities include Wi-Fi throughout the property, on-site garage parking with 174 spaces, Car2Go car sharing program, study lounge with public and private study rooms, on-site yoga and meditation classes, PC and Mac bar, rooftop pool, outdoor rooftop theater, outdoor rooftop gourmet kitchen, fitness center and top-floor sky lounge. “The west campus area of the university is a thriving neighborhood that’s vibrant enough to spark the mind of any student. We want the Muze to reflect that,” David Pierce, principal of Parallel Co., the developer of the project, said in prepared remarks. The design team is led by architecture firm Rhode Partners, with interior and product design by Sixthriver, and with Rogers-O’Brien as the general contractor. The community is slated for completion by fall 2019. The newly expanded Paloma Ridge will seek LEED, Fitwell and WiredScore certifications to make it a "smart," green and healthy building as a way to compete with other class A projects rising around Austin. A Denver-based private equity firm wants to attract tenants searching for respite from high rents and traffic downtown by nearly doubling the size of a Northwest Austin office complex. By early next year, Ascentris LLC plans to break ground on a 160,000-square-foot expansion of Paloma Ridge, a relatively new complex located at 13620 Ranch Road 620, about three miles east of Lakeline Mall. Once construction is complete in late 2019, the entire office complex would total roughly 371,000 square feet across three buildings. It is a significant expansion for the far northwest office submarket, where total vacancy for class A office space was at just 5.7 percent at the end of the second quarter, according to research from CBRE Group Inc. The average class A vacancy rate for all of Austin was 10.3 percent. Demand in Northwest Austin "seems to be ‘on’ right now," said Jake Rome, senior vice president for Ascentris, adding that the company already has "a handful of tenants on our prospective list" for the third building. Rome and several members of the Ascentris team previously worked together at Amstar Group LLC developing projects such as downtown's 823 Congress office building, The 704 apartment complex on South Lamar Boulevard and the Travaasa Hotel near Lake Travis (now owned by Hyatt and undergoing renovations). Ascentris spun out of Amstar Group in 2015. Ascentris bought Paloma Ridge in December last year when the property was about 70 percent leased. Stream Realty brokers Edvin Beasley and Scott Deskins landed tenants for the remaining space in about six to eight months — a quicker turnaround than expected, Rome said. "Paloma Ridge successfully filled a void in the Austin office market by offering brand new class A space at a significant rent discount to new construction,” said Beasley in a statement. Paloma Ridge also appeals to tenants with employees who live in the fast-growing residential areas of North Austin. Now Paloma Ridge’s anchor tenants include cable company Spectrum/Charter Communications Inc. at about 30,000 square feet; homebuilder Lennar Corp. at just over 30,000 square feet; software company Informatica LLC at about 55,000 square feet; and health care tech company eHealth Inc. at about 28,000 square feet. Rents for space at the new building aren’t finalized but will likely be around $25 to 29 per square foot, before triple-net fees, Rome said. That compares with an average asking rate of about $52 per square foot for downtown class A space in the second quarter, according to CBRE. Beasley and Dawkins are the leasing brokers for the Paloma Ridge expansion. The new three-story building will have 55,000-square-foot floorplates that can easily be halved, plus a private terrace on the third floor. The design includes a high-end fitness center with “spa-quality” locker rooms, a one-mile jogging trail and outdoor amenity areas. Sixthriver Architects, which designed the first two buildings of Paloma that were completed in 2016, will also finish design the third and final phase of the office complex.The general contractor is Hoar Construction and Big Red Dog is the engineer. Rome said Ascentris will continue looking for investment opportunities in Austin, including developing new buildings and repositioning existing space. With $1.1 billion in assets, Ascentris invests in and manages institutional real estate, both directly and through joint venture partners and on behalf of institutional clients. A rendering of the 'paseo' walkway at The Foundry at Third and Comal streets in East Austin. As the east side buzzes with new development, Cielo Property Group and DPR Construction Inc. will be at the center of it all. 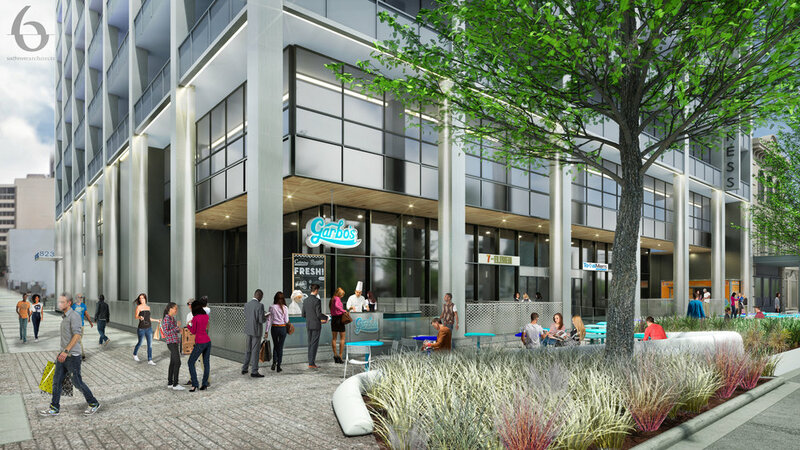 Cielo announced Monday it has broken ground on The Foundry, its three-story, 95,000-square-foot creative office and condo building at 310 Comal Street, a few blocks from I-35. DPR Construction will build the "modern warehouse-style" building, and then turn around and lease 30,000 square feet of it for its own offices. DPR Construction — which also is building Third + Shoal, the 29-story office tower Cielo is developing with TIER REIT Inc. — said it has outgrown the office it has occupied for 20 years in Stonebridge Plaza, at North MoPac Expressway and Capital of Texas Highway. Based on the projects it's handling, DPR can have between 550 to 650 employees at a time in Austin — quadruple the number it had in 2013, said Matt Hoglund, Central Region leader for DPR. It also billed $239.85 million in the region in 2016, making it one of the busiest commercial builders in Central Texas. DPR plans to move into The Foundry by March 2019. That will allow it to be be closer to many of its projects and clients downtown, Hoglund said. “We want to be part of the development on the east side and downtown and be a contributor down there,” he said. The space will also offer employees better access to restaurants and other amenities. The Foundry will be half a block from the MetroRail stop at Plaza Saltillo and adjacent to the Lance Armstrong Bikeway. A bike maintenance facility and 75 bike spaces will be available on site, along with a fitness center. The Foundry also represents Cielo’s first leap into the growing East Austin market. “We like the innovative things happening over there," said Bobby Dillard, Cielo co-founder and principal. "We saw a lot of tenants occupying spaces in older warehouses and we wanted to deliver some really cool space ... that fosters creative tenants." An underground parking garage will offer 255 spaces, which can double as nighttime parking for visitors to the area’s nearby restaurants and bars, Dillard noted. The Foundry’s design is a modern take on the warehouses dotting the east side. A rendering of what The Foundry will look like inside. Sixthriver Architects incorporated exposed ceiling, concrete, warehouse-style columns, reclaimed wood, brick and decks to create an industrial design. Steel from the original Driskill Hotel laundry facility will be incorporated into some art. After Austin City Council unanimously approved the project in April 2016, Cielo waited to break ground until it could secure significant pre-leases. DPR's 10-year lease will occupy just under half of the 76,000-square feet of office space. For the remaining space, Cielo seeks office tenants from industries where a little invention and creativity is needed — such as such as engineers, programmers, designers and architects. The building's name refers to a term for a metal workshop. “We wanted to connect to the entrepreneur vibe of East Austin,” Dillard said. In addition to office space, Cielo has pre-sold eleven of the 17 condos on site, according to the company. 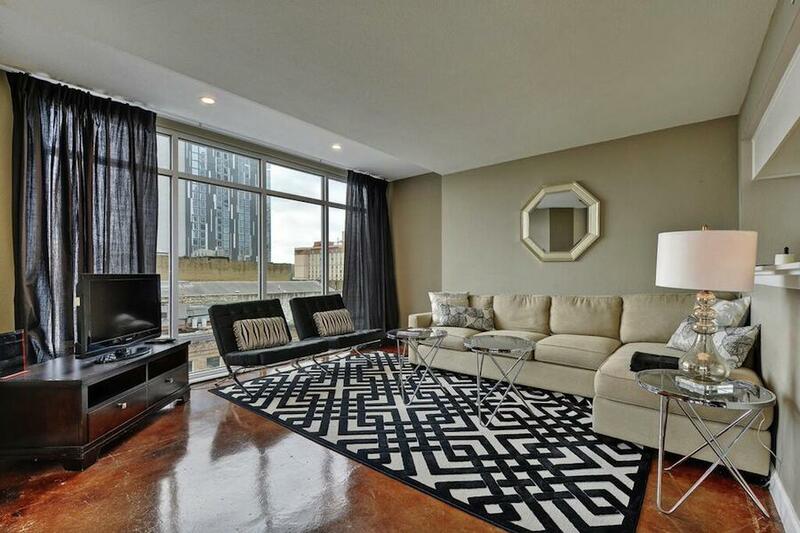 The condos range from about 664 square feet to 1,240 square feet. Independent Bank provided the construction loan on the project. Troy Holme, Casey Ford and Katie Ekstorm of CBRE Group Inc. are the leasing brokers. The Foundry site was previously occupied by Habitat for Humanity ReStore. Cielo worked with Habitat for Humanity to devise a unique solution to meet the city’s affordable housing requirements. Under city code, the size of the project would require Cielo to preserve 10 percent of the building for affordable housing or else pay a fee. Cielo volunteered to pay $93,000 (above the minimum fee), and reserve a three-bedroom, family-friendly condo as an affordable unit at The Foundry. The complex plan also involved a land swap between Cielo and Habitat that enabled Habitat to build an affordable condo project a few blocks away. Cielo also donated $200,000 to cover the non-profit’s cost of relocating utility lines at Habitat's new location. Another innovative twist to the project: Cielo said it will also seek to become one of the first Austin buildings to earn WELL Building Certification from the International WELL Building Institute. The certification designates buildings designed with employee wellness in mind — setting standards on everything from air pollution and water quality to access to fitness programs on site. The wellness factor and the hip new location will help attract talent for “the new generation” of workers who increasingly demand a ‘live-work-play’ environment, Hoglund said. A rendering of the outside of The Foundry. Austin, Texas — Parallel CO, a new venture formed by industry veterans David Pierce and Kristen Penrod, has announced plans for MUZE, a 502-bed student housing development located blocks from the University of Texas campus in Austin. 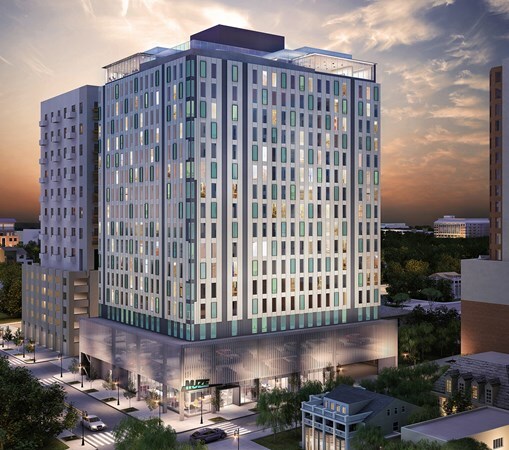 The 18-story high-rise is scheduled for delivery in fall 2019. Community amenities will include a rooftop swimming pool, outdoor theater and kitchen area, fitness center, community gathering spaces and a state-of-the-art study floor with spaces for individual and group study. Units will be fully furnished with a custom designed furniture package. The architect for the project is Rhode Partners and Rogers-O’Brien is the general contractor. Sixthriver will provide interior and product design services. 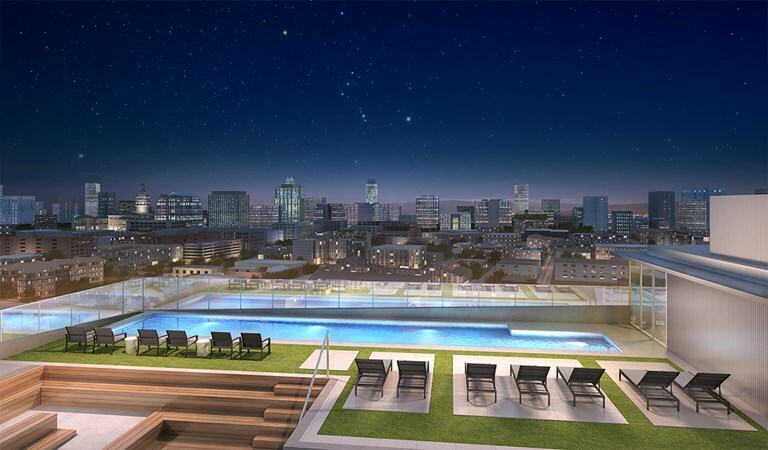 MUZE, located blocks away from the University of Texas in Austin, will offer shared amenities including a rooftop pool. AUSTIN – Canstruction® was founded in 1992 by the late Cheri Melillo and her colleagues from the Society for Design Administration (SDA) with a vision of uniting design and engineering through a unique and fun medium that will improve the lives of the underprivileged and underserved. Canstruction competitions are held annually in over 150 cities around the world – and someone has to organize them. For the last nine years in Austin, those organizers have been Katarina Villasenor, COO and principal at Sixthriver Architects, and James Foster, architect at CTA Architects Engineers. Sixthriver is in its 22nd year and Villasenor has been there for 15. “I worked my way up to where I am, I started doing administrative work for dot.com companies,” Villasenor says. She says that with that previous technology experience, it has only enhanced the data driven responsibility that is required in managing a design firm. Villasenor was born in Sweden and moved to Mexico where she also grew up. She moved to Texas in 1994 and has lived here for 17 years before pulling up stakes again. She now calls San Francisco home, although she spends two weeks out of every month in Austin and works remotely the other two weeks. “I don’t mind traveling back and forth at all,” she says. Villasenor says even though pulling the event together is a significant commitment, she understands the need to help with addressing hunger in the community. She’s also been involved with Meals on Wheels and Fishes and Loaves [sic]. In her spare time, Villasenor loves to travel and says some of the places that stand out are Hawaii, Austria, Germany, France and Spain, although she is very much looking forward to an upcoming trip to the Galápagos Islands next month. This trip will allow her the opportunity to focus on her other hobby, photography. A California tech company that is expanding quickly in Austin is gaining traction with its cloud-based construction management platform. Procore Technologies Inc. — a Santa Barbara, California-based company that recently landed on Forbes’ 2016 billion-dollar startup list — is amplifying its Austin profile. The cloud-based construction management software company recently moved into about 18,000 square feet on the 18th floor of Chase Tower at 221 W. Sixth St. after spending three years in co-working spaces, most recently at WeWork. “Procore is becoming really valuable to large companies, but we can really provide a leg up for smaller contractors,” said Doug Madey, Procore’s director of communication. Austin’s deep pool of tech talent prompted Procore to open an Austin operation in June 2013 with one person — Jeff Kemper — and now the local operation is up to 50 employees. The new space can accommodate 50 more, Madey said. The rapidly growing company also recently secured $50 million in funding, lifting its total capital investment to about $179 million. San Francisco-based Iconiq Capital led the most recent fundraising effort. Procore expects to deploy its latest capital round to deliver more programs and expand internationally. CEO Tooey Courtemanche founded the company in 2003 in Silicon Valley after learning the ins and outs of the software business. His entry into the construction field began while building a new home for his family. He was stunned by the lack of coordination among the people he had hired. Just a decade ago, the construction business was decidedly low tech. Many companies simply didn’t know how to use technology effectively. Courtemanche started with a web-based collaboration tool, and he acknowledged in comments on the company's website that it was slow-go for years. Other software developers also tried to infiltrate the construction industry, but the 2008 economic upheaval put the nail in the coffin of many of those businesses. Many of the giant construction companies still operate their own technology systems, but Madey said they are expensive to maintain. Procore, he said, manages the entire process, ensuring that the smallest details are covered. Delivering the right materials at the exact time, for instance, can equate to thousands of dollars in cost efficiencies. “Everybody is recognizing the benefit of cloud technology,” Madey said. Cresa Partners represented Procore in its search for office space. Sixthriver Architects created the design, and The Burt Group handled construction. East Dallas' popular Henderson Avenue retail and restaurant corridor will soon be getting a condo development. Builder Larkspur Capital plans to build the residential building near the corner of Capitol Avenue and Henderson. said Larkspur partner Carl Anderson. "The units will average 1,700 square feet and will all be flats. "The exterior of the building will consist of a unique blend of materials that results in a contemporary urban feel," Anderson said. " The interiors will include hardwood floors, quartz countertops, custom cabinetry, and Samsung Wi-Fi enabled appliances." The condos will start in price over $400,000. Larkspur plans to start construction on the building next year. The city approved plans for the project in August. The development is one of the few new condo projects on the way in North Texas. "We think that the market is ready for this type of product given the continued rise in single-family home prices coupled with the trend toward close-in urban living," Anderson said. "We plan to leverage off the significant upcoming retail development planned along Henderson Avenue." He said the condo project should be completed in the fall of 2018. Larkspur is building several townhouse projects in East Dallas and has a small apartment building in the works for a site on Live Oak Avenue. While thousands of new apartments are in the development pipeline in the Dallas-Fort Worth area, builders have done few condo units. Most of the new condos have been in high-rise buildings. The Kendra Scott headquarters embodies an old "Hollywood flair" that is lush and softened by pattern and textures; a space which emphasizes Kendra Scott's commitment to her employees and the community. Pick up a copy of the November issue of Marie Claire to read more about the new Kendra Scott corporate HQ designed by Sixthriver. A new office project is scheduled to break ground in a few days west of Barton Creek Square mall. Walsh Tarlton Overlook, designed by Austin-based Sixthriver Architects, will yield 55,000 square feet of class A office space in a desirable area where vacancies have been scarce. The Texas Department of Licensing and Regulation indicates that the project is valued at $9.5 million. JTM Development in partnership with Cypress Real Estate Advisors is building the upscale office project. Headed by J. Thomas Mercer, JTM has previously built Rob Roy Office Park, also in Southwest Austin, and has entitled numerous residential developments across Central Texas. Mercer is handling the pre-leasing. He is a former executive of Prologis Trust and Panattoni Development Co. The only other office project currently underway in Southwest Austin is the Lantana Ridge office complex at 7601 Southwest Parkway, which will be fully occupied when completed by Yeti Coolers LLC. Lincoln Property Co. is the developer. Walsh Tarlton Overlook is scheduled to open sometime next year and will feature limestone, marble and walnut finishes. Elevators from the five-level underground parking garage will deliver employees directly to their offices. The Burt Group is the general contractor. TBG Group is the landscape architect. Cypress acquired the land in 2007 when it purchased a Cinemark theater that been located on the site. Cypress rezoned the property in 2011 to provide for mixed-use development. Residential projects are underway nearby. Centro Development LLC, headed by Kent Collins, is building the Westerly, which includes 168 multifamily units and 21 townhouses. Chupik Properties and Design Inc. in partnership with Prominence Homes is building The Walsh, 55 luxury townhouses, just west of the office project. Brandywine Realty Trust (NYSE: BDN) has been active in the Austin market for the past decade, but in the past two years it has become one of Austin's largest landlords. Today the real estate investment trust owns about 2.7 million square feet of office space in the Austin market with joint venture partners DRA Advisors. Though the company is headquartered in Radnor, Pennsylvania, executives wanted to up the Austin profile — even to the extent of deciding to rent space in someone else's building downtown. Currently, Brandywine's portfolio is scattered throughout suburban areas, where their local staff has been based. But there's more potential brewing in the Austin market. In fact, Brandywine recently acquired a premium site downtown for development. After President and CEO Gerard Sweeney came for a visit, the Austin executive team was encouraged to seek out something prominent — a place that could be leveraged to market the Brandywine brand to big time investors. "When we realized we could get the top floor with these grand views, we just knew," said Bill Redd, executive vice president and senior managing director of Brandywine Realty Trust. The 5,000-square-foot space at the peak of the pyramid at One Congress Plaza, 111 Congress Ave. had been occupied for some time by Austin attorney and real estate investor Jimmy Nassour. His law office relocated to Bee Cave Road, and Brandywine negotiated a deal with Parkway Properties (NYSE: PKY), another national real estate company which owns the downtown property. All was very cordial, and Brandywine hired Austin's Sixthriver Architects to create the open planned design. Trimbuilt Construction Inc. handled the build-out. The size is modest but the views are stunning. "This makes a statement for us," said Ralph Bistline, senior vice president of Brandywine based in Austin. Manzanita Hall makes a striking statement on the northern edge of the Arizona State University, Tempe, campus, across from the Sun Devil Stadium and blocks from the downtown. Climbing up the 15-story dormitory's curved facades is a precast structural diamond-shaped lattice that was innovative for its time—Cartmell and Rossman designed the 1967 building—and still looks radically cool. If Sally Draper, Don Draper's daughter on Mad Men, went to ASU, she probably would have lived in Manzanita, originally a women's dorm. Though Manzanita (“Manzy”) was a beloved campus icon, with its groovy Y-shaped plan, by the time Solomon Cordwell Buenz (SCB) conducted a feasibility study in 2007 to determine whether the building could or even should be renovated, it had badly deteriorated and was not up to code or serving the needs of students. Jim Curtin, SCB principal, gathered university engineers who worked in the building to talk about which of the mechanical systems could be salvaged. “My focus group, scheduled for 45 minutes, turned out to be five minutes. They basically said nothing could be preserved,” he says. But the building had sentimental value and good bones—it featured the first use of post-tension concrete in Arizona when it was constructed. Initially, Manzanita's developer-manager, American Campus Communities (ACC), wanted to raze Manzanita and build new dormitories, but ASU was able to negotiate a financial scenario with ACC to support the renovation. The project's architect of record, Phoenix-based Studio MA, has had a long-standing presence on campus. Principal in charge Christiana Moss worked on ASU buildings at other firms, and Studio MA principals Dan Hoffman and Christopher Alt both taught at ASU. (For Manzanita, Studio MA worked with SCB as associate architect and Sixthriver Architects on interior design.) The dormitory reopened in the fall of 2013 to house freshmen in the College of Liberal Arts and Sciences. To bring the building into the 21st century, Moss and her colleagues felt they had to first redo the skin, relieving the precast lattice of infill. Originally, the dorm's windows and frame walls were set into the lattice. Today, a system with alternating glass and copper-toned vertical metal panels is set back 6–12 inches from the lattice (mimicking the reddish color of the indigenous Manzanita tree's new growth). The panels help with thermal performance, and also make the pale frame pop. “To accentuate the lattice and really articulate it was part of making the building modern again,” says Moss. While Manzanita remains a residence hall, its program might as well be brand-new—student housing has changed so completely since it was built. “It's far more of a destination as opposed to a necessity,” says Curtin, of dorm life. Students want flexibility and personal space, but, most importantly, they want connection and community. In the “old” Manzanita, students complained about never encountering classmates who lived on the same hall, recalls Curtin. The architects remedied this by creating two-story lounges in the northeast leg of the Y. Each lounge serves two floors of dorm rooms. To create space for the lounges, the architects pushed out the original northeast exterior wall, just shy of two L-shaped shear walls, adding floor-to-ceiling glazing. The original muscular X-bracing of the lattice is now part of the interior, demarcating the lounge mezzanines. Kitchenettes and laundry rooms are on the lounges' lower floors, connected by a stair to the mezzanine levels, where students can watch television and relax. To accommodate the new floor plan, which also has larger room suites lining the perimeter walls (the bed count went down in number, from 1,000 to 814), the architects had to gut the interior, including all systems. Before new plumbing risers and mechanical chases could be inserted, every penetration in the post-tensioned slabs had to be x-rayed, on every floor, says Moss. Because the post-tensioning cables were not laid out consistently on each floor, they did not align, and flexible plumbing risers were installed to account for the irregularity. In addition to the replacement of the frame wall, the other big structural move at Manzanita was to demolish one of the four 12-inch-thick, 15-story, cast-in-place shear walls. This allowed the architects to insert two new code-compliant elevators. (Robotic demolition machines removed the walls after the building's exterior skin had been removed, in order to avoid full wind loading.) A new shear wall was then installed, 4 inches back from its original location. Studio MA and SCB also enclosed two sets of open-air stairs on the east and west sides of the building, glazing the shafts and mechanically ventilating them for required smoke evacuation. Manzanita's lobby—just like its original dormitory floors—was isolating, dark, and uninviting, entered through a long, narrow, cast-in-place Corbusian ramp. “It was so depressing,” says Moss. She and her colleagues raised the entire surrounding plaza and created a shade canopy, whose lattice mimics the facade. To flood the lobby with daylight, they removed stucco fasciae from exterior window walls and added skylights. Inside, they exposed original terrazzo that had been buried under vinyl tile, and inserted offices, a multifunctional classroom, and a computer center, giving the lobby an airy, cheerful atmosphere. Restoring Manzanita is in line with two of ASU's major goals, says university architect Edmundo Soltero: providing the infrastructure for a desired 100,000 students by 2020 across all campuses, and changing what had traditionally been a commuter campus into one that students call home. To do that, the campus and its buildings “have to speak to a harsh desert environment,” says Soltero. Moss agrees, noting that there is something disturbing about all-glass buildings—not an uncommon sight in Tempe—for a place where temperatures often reach 120 degrees Fahrenheit in the summer. At Manzanita, though the architects increased glazing by 15 percent, simulations showed that they are able to achieve a 12–18 percent performance increase simply by pushing the skin back from the lattice. “The R value of the original wall—we analyzed each layer—came out to 3.5. It was a real energy hog,” says Moss. Now the opaque walls have an R value of about 22. Brief: To craft a 17-story $60 million privately owned residence hall. 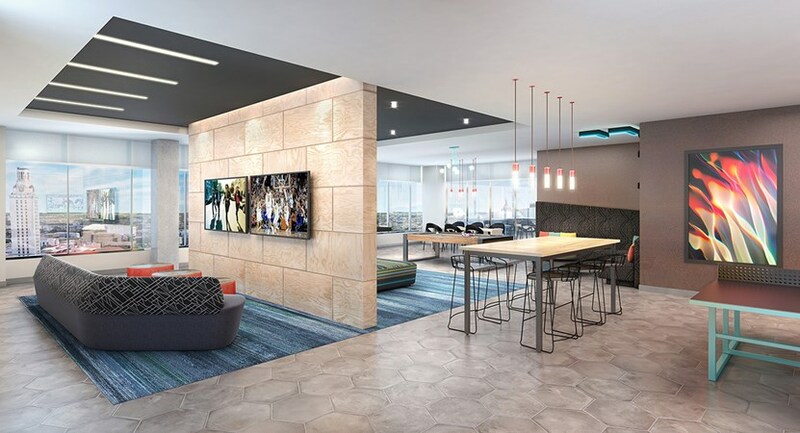 "Since our client is based in Austin where the university is located, they wanted this property to be their flagship student housing project," says Jill Lung, Sixthriver's director of interior design and shareholder. "We encompassed the newest technology, amenities, and support for the university living and learning experience." 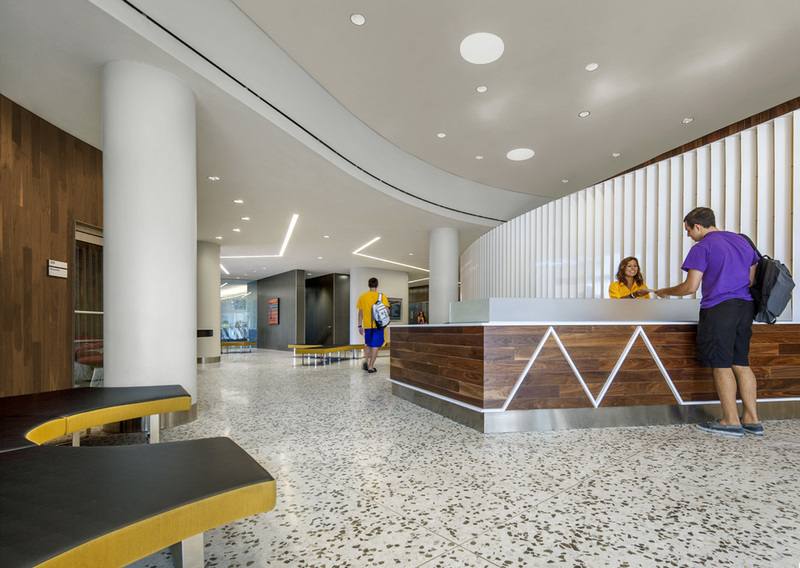 Aesthetic: "University of Texas students take great pride in their school and have a strong alumni base, so we wanted to creatively incorporate the school mascot, the longhorn, and the school colors, burnt orange and white," Lung says. 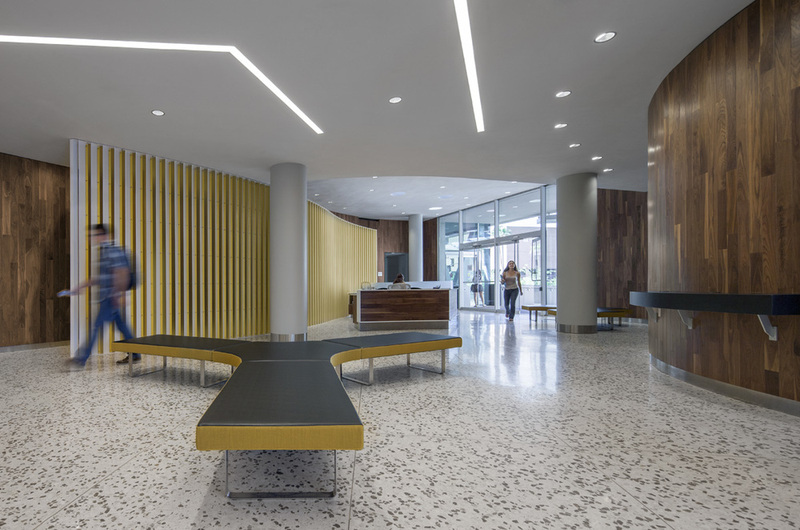 The lobby's modern, comfortable, and durable design also features porcelain tile flooring, textured limestone veneers, and a cedar plank ceiling. Highlights: Locally sourced artwork that weaves in Austin's music scene and culture: a visible central movie theater area that features game consoles ("We knew the Millennial residents like to be interactive, social, and seen, so to incorporate all three of these elements we encapsulated the theater in glass," Lung explained); and outdoor spaces with sweeping views of the city's downtown skyline and the university's campus. There’s a new facet to Kendra Scott’s thriving jewelry business: real estate. 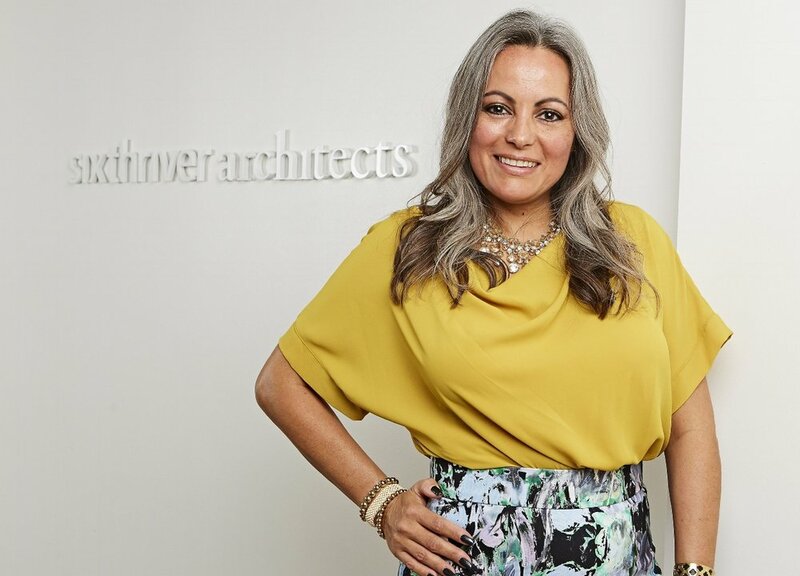 Austin’s fashion maven, through her signature company Kendra Scott Design Inc., is ponying up some big bucks to advance the brand with a new corporate headquarters, new flagship store and a distribution warehouse. The exact investment numbers weren’t disclosed by Lon Weingart, chief operating officer for Kendra Scott Design, but documents on file with the Texas Department of Licensing and Registration show that the build-out of distribution space in Southeast Austin is valued at $2.7 million and the tenant improvements for the 43,500-square-foot corporate headquarters at 3800 N. Lamar Blvd. are valued at $4.9 million. Kendra Scott's corporate headquarters is designed to reflect her particular aesthetic sensibilities. Designers studied aspects of her personal life - such as her home - to determine the ultimate ambiance of her new corporate setting on North Lamar Boulevard. Weingart said revenue for 2014 was about $75 million — stunning results, given that Scott began her empire with $500 in 2002. Now her distinctive jewelry designs are carried by retail goliaths such as Nordstrom and Bloomingdale’s. Like many top-tier designers, Scott now has her own line of boutiques in the trendiest neighborhoods around the country. More than 25 shops currently are open in chic retail centers from Boca Raton, Florida, to Newport Beach, California. Nearly 10 more are due to open soon, including one on storied Michigan Avenue in Chicago. The workforce has swelled to about 650 employees, with some 160 of those in the corporate office. “We’ve just cross the line where we cannot execute efficiently in our current space. This will help us in the next few years,” Weingart said. Kendra Scott’s first store and offices have been a mainstay at 1400 S. Congress Ave. Over the years, the company has cobbled together other space for distribution and an expanding workforce, but it became clear in the past two years that there had to an overarching plan. The executive team hired consultants to determine what was necessary to support growth. A large warehouse became a priority. A survey of existing distribution employees showed that most lived in South Austin, and real estate brokers John Childers and Zane Cole with JLL honed in on the new build at Expo Business Park not far from Burleson Road and Ben White Boulevard. “This particular site is under construction and it was just more efficient for us to do something new,” Weingart said. Trammell Crow Co. and Clarion Partners are the joint venture partners of Expo 11, which is part of the larger Expo Business Park. The developers are represented by Ace Schlameus, Mark Emerick, John Barksdale and Darryl Dadon of CBRE Group Inc. Kendra Scott will occupy about half of the building at 6213 E. Stassney Lane, having signed a 64,800-square-foot lease. The property should be ready in October. Warehouse and distribution space generally are pretty mundane, but windows and views are a part of the equation here — another strong plus for employees. The property is 100 percent climate controlled. “Building 11 is located on a bluff and features nice vista views, which is unique for an industrial development,” Schlameus said. Weingart said anticipation is high for the new corporate headquarters, which likely will be finished early next year. Employees that have been scattered among five or so locations will be consolidated on the fourth floor of the new Lamar Central mixed-use project at 3800 N. Lamar Blvd. Houston-based Highland Resources is the developer. A new 1,500-square-foot flagship store will open at that location, too, though Kendra Scott will retain its South Congress location. Austin-based Sixthriver Architects is handling the design of the distribution and corporate space. Embree Group in Georgetown — a prominent national retail developer — handles the design and construction of all Kendra Scott stores across the country. As early as July, there will be a new spot to vacation — or staycation — in Austin. Top Trip Rentals, a vacation rental property company based in Austin, has announced the launch of Littlefield Lofts, part of a multimillion dollar exterior remodel happening at 119 E. Sixth St., across from the historicDriskill Hotel. Although iconic, Sixth and Brazos may not seem like the most happening corner in the city, but that’s likely changing. Littlefield Lofts and the 30,000-square-foot Gold’s Gym on the ground floor are part of Stream Realty Partners' multimillion-dollar revitalization of the ixth and Congress city block. The renovated block includes a 26-story tower, three parking areas and the Austin headquarters of Dropbox Inc.